Benoil has recently developed a range of proving spheres for oilfield applications. They are available in a range of materials and diameters. 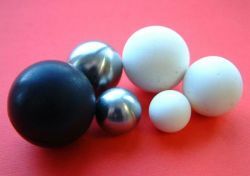 Shown here are some epoxy resin spheres made to a defined Specific Gravity. Also shown are Stainless Steel (316) and Titanium spheres. 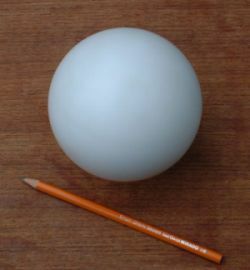 Over-moulded spheres can also be produced, and either supplied as moulded or with the flash removed. Almost all of our products in this field are tailored to a suit a specific requirement. The parts shown above range in diameter from 3/8" to 1-1/2" but both smaller and larger spheres can be made on request. These are the largest Acetal spheres made to date at some 6" in diameter. Benoil makes and supplies both solid material and coated spheres to customer specific demands. We produce both special-run small batches and also in much larger quantities.